By Dan Ambrose: Former WBA lightweight champion Ray ‘Boom Boom’ Mancini says he thinks Golden Boy Promotions CEO Oscar De La Hoya will never allow for Saul Canelo Alvarez (50-1-2, 34 KOs) to fight Gennady ‘GGG’ Golovkin (38-1-1, 34 KOs) for a third time due to how punishing the fight would be. Mancini had Golovkin winning both fights against Canelo. He thought GGG out-boxed Alvarez in both of their encounters. Mancini says Canelo used more forward aggression in the rematch, but he was unable to back Golovkin up against the ropes. GGG kept the fight in the center of the ring, and was smacking Canelo with hard shots as he came forward. Mancini says he doesn’t understand why Canelo wouldn’t immediately get back in the ring to fight GGG a third time. Mancini states that boxing greats ‘Sugar’ Ray Robinson and Jake LaMotta would have gotten back inside the ring to face each other for a third time if there was controversy surrounding the first two fights. Canelo, 28, is speaking like he’s satisfied with his controversial 12 round majority decision win in his rematch with Golovkin on September 15 of this year. Canelo won by the scores 115-113, 115-113 and 114-114. Press row scored the fight overwhelmingly for Golovkin, as did many boxing fans. “There was controversy in the first fight, so they did a second one,” Ray Mancini said to Fighthub about the two Golovkin vs. Canelo fights. “There’s still controversy. Let’s do it a third. Why wouldn’t they do a third? If this was Ray Robinson and Jake LaMotta, they’d come right back and do it,” Mancini said. It’s hard to compare Canelo with warriors like Ray Robinson and Jake LaMotta. He’s not that kind of a fighter. Robinson and LaMotta were willing to face anyone during their career. It took Canelo three years before he finally fought GGG after he turned 35-years-old. To some boxing fans, they believe that Canelo and his promoters at Golden Boy Promotions intentionally waited until GGG got old before they made the fight. When Canelo fought at 154, he never faced Jermell & Jermall Charlo or Jarrett Hurd. Those were three of the top guys at junior middleweight when Canelo was fighting in that weight class. Canelo did fight Erislandy Lara and beat him by a 12 round split decision in 2014. However, the fight results were controversial with many boxing fans believing that Lara had done enough to deserve the decision. Rather than clearing up the controversy by facing Lara in a rematch, he was told to get in the back of the line for a second fight with Canelo. The controversy arguably hurt Canelo’s career in the eyes of a lot of fans, as they saw him as a pampered fighter, who was given a decision over Lara that he didn’t deserve. Not wanting to clear up the controversy was a bad look for Canelo. Lara did the same thing to Canelo that Floyd Mayweather Jr. did in using his jab and reach advantage to tag him all night from the outside. Mayweather was given a decision over Canelo, but the less popular Lara found himself the loser. Canelo landed only 31 head shots in the entire fight with Lara. That low of a number generally means that the fighter should have lost the fight, but not in this case. “Do you think he’ll [Canelo] make more money against Rocky Fielding than GGG?” Mancini said. “I know they had hard fights, but that’s what the fans want, and that’s what the fighters should want. You go from GGG to Rocky Fielding when there’s still a lot of dispute about that fight. I think you’d want to go clarify that,” Mancini said. We know what Mancini would have done if he had been involved in a controversial outcome during his own boxing career, but this Canelo we’re talking about. He clearly marches to the beat of a different drum. If Canelo really believes he beat Golovkin twice, then he might decide to ignore the boxing public’s pressure for him to fight GGG again, and instead take lower payday fights against safer opponents like Rocky Fielding, David Lemieux and Gary ‘Spike’ O’Sullivan. Lemieux is expected to be Canelo’s opponent next May for his fight on Cinco de Mayo. It’s a poor fight, given how bad Lemieux has looked in the recent past against Billy Joe Saunders. “I thought GGG won the first fight and the second one,” Mancini said. “The difference between Canelo this time than the first time was he came forward and GGG went back. There’s a thing called effective aggression. If you’re coming forward and getting smacked, that ain’t effective aggression. He never had GGG on the ropes. If he did, he didn’t keep him on the ropes. GGG controlled center ring. He controlled it. The 12th round, I thought was the most decisive round for GGG. So if there was any question, he closed the show in the 12th,” Mancini. Two of the judges gave Canelo the 12th round against Golovkin in the rematch, which was considered to be the best round of the fight for GGG by a lot of boxing fans. If those two judges had given GGG the 12th round, as many people did, then the fight would have been scored a draw. Canelo was exhausted after nine rounds in the rematch, and he was hurt badly in the 10th and 11th rounds by Golovkin. 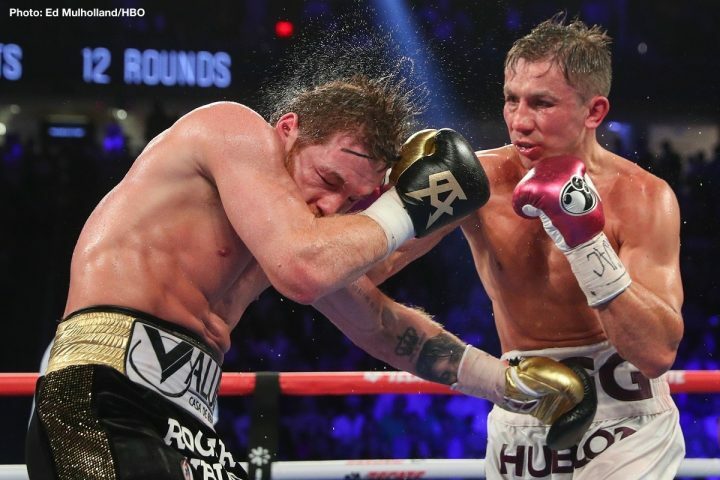 The 12th was a continuation of those two rounds with GGG punishing a tired Alvarez with hard power shots. The tide of the fight had completely changed hands during the championship rounds with GGG getting the better of the action. It’s a bad look on Canelo’s part that he’s not fighting GGG for a third time in a neutral venue outside of Nevada. De La Hoya’s main money fighter in his Golden Boy Promotions stable is Canelo. If the judges had scored his last two fights the way that the boxing public saw them, with GGG winning, Canelo’s career wouldn’t be nearly as bright as it is right now. There’s a big difference between a 1-0-1 record in Canelo’s last two fights than an 0-2 record, which many boxing fans think he should have.